After its most successful year since the economic downturn, Creagh Concrete has scooped a £5m contract to build a new library for a university just outside London. The Toomebridge Company, which created 100 jobs last year, will start work at the University of Roehampton Complex in April. And more jobs could be in the pipeline as the business continues to grow, win more contracts and invest across its seven locations. The Roehampton project runs for 35 weeks and will see the family owned company construct an architecturally exposed concrete frame with brick-faced precast panel façade for the impressive new building. Creagh Concrete’s Managing Director Seamus McKeague said the announcement was the first of many to come this year. “Creagh is entering 2016 in confident mood,” he explained, “and we are pleased to announce this prestigious contract at the University of Roehampton. “We’ve been involved in a previous similar project with the architect, Feilden Clegg Bradley, on the new Manchester Metropolitan University Student Union building, and look forward to continuing our excellent relationship with them. We’re also pleased to be working with contractor Geoffrey Osborne, with whom we are forging a great working relationship. 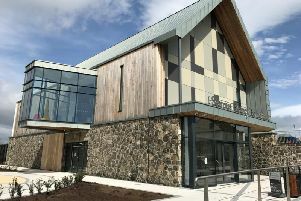 The company said it is also working on a range of exciting projects across the UK, such as a £3m flooring project at the new Ulster University campus, a £2.1m car park in Leeds and a £1m school project in London. It will also announce further infrastructure and construction projects in the coming months. As part of its strategic objectives, the business plans to invest across its seven sites in the next five years, with plans for further job creation as the business continues to grow. With a number of specialist divisions working within each sector of the construction industry, Creagh Concrete’s core range is precast structural products and prestressed flooring. It employs 650 full time staff and sub-contractors and completed over 3,000 contracts of varying sizes in 2015.